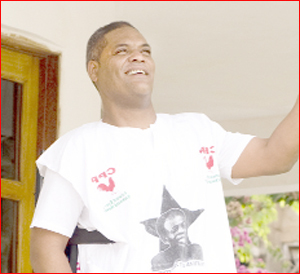 The Convention People’s Party (CPP) goes to polls today to elect a flagbearer to lead the Nkrumahist party to the 2016 general election scheduled for November 7. The National Delegates’ Congress, which is scheduled to take place at the Trade Fair Site in La, Accra, would see 2,600 delegates from all 275 constituencies across the country in attendance. Four persons are gunning for the topmost position, including immediate past party Chairperson Samia Yaaba Nkrumah and former General Secretary Ivor Kobina Greenstreet. Others are Lawyer Bright Akwetey and new entrant Joseph Agyapong, a businessman. But the contest is seen as a straight fight between Samia and Ivor Greenstreet, even though the two others are equally confident of pulling surprises. Even though a live television debate organised for the four to sell their messages to the delegates did not end up with a clear winner, it proved to be an interesting event since it offered them an opportunity to market themselves. Samia, who is basking in her father’s glory, said when given the opportunity to lead the country, she would finish Dr Kwame Nkrumah’s (her late father’s) unaccomplished seven-year development plan for Ghana and adapt it to the current situation. She however suffers the disadvantage of being considered a not-too-successful chairperson when she presided over the party. Samia is also seen as a divisive leader and has been accused of pushing Dr Nduom out of the party. Mr Akwetey, an ardent Nkrumahist who is aspiring to lead the CPP as a presidential candidate for the third time, says “watching the CPP, once the touchstone of political power in Ghana and institutional machinery that laid the foundation for the prosecution of the progressive agenda of our nation, sink to such depths of virtual dormancy has provoked me to liberate the priceless heritage.” He pledged to fight corruption in the country with an iron fist. On his part, new face Joseph Agyapong said the country needs to build systems, including a national database, for the sustainable development of the country. His campaign of injecting resources into the party, coupled with the display of cars and logistics, is indeed boosting his chances. Delegates say they would support whoever is given the mandate to lead the party after the presidential primaries. Whoever wins today’s contest would be burdened with the task of forming a formidable CPP to match the New Patriotic Party (NPP) and the National Democratic Congress (NDC) in the 2016 elections. More than 500 police personnel have been dispatched by the Accra Regional Police Command to provide security at the CPP congress. The personnel, according to Commissioner of Police (COP) Dr George Akuffu Dampare, Regional Police Commander, would make sure that the election is held smoothly without any disturbances whatsoever.